Although Jon Lawrence of Electronic Frontiers Australia was billed to start the day, Andrew Pam kicked off after Lev Lafayette opened the session. Mirroring a presentation given at linux.conf.au in in Canberra in January 2013, Andrew explored many of the free and open source software tools available in rich media content creation. He introduced the topic by demonstrating how the concept of FOSS has extended beyond software development into content creation, and showed how open tools are sometimes ahead of the proprietary ones – particularly in the 3D space. Andrew also outlined how open formats are even more important than open software, using the example of not being able to open a file in several years time because the software used to produce it no longer exists. This was a very strong point in the digital design arena, where players like Adobe set file standards – such as .psd and .ai early on, and other software has had to follow suit. Andrew explained that one of the early drivers behind FOSS text editors was the need to represent non-Roman characters. This spread to tools for translation, and even for script editing and producing. This sparked a discussion on whether HTML5 should be the basis for all documentation in the future – separating the content and the markup – as many other tools are simply leveraging HTML5 content for other display or output formats. Specifically, web browsers are moving into the presentation space, particularly with the animation capabilities of HTML5 and CSS. One of the poignant examples of this talk that underlined the social justice aspect of the free and open source model was that of LibreOffice. LibreOffice is available in many smaller languages – such as Icelandic and Welsh because the tools are freely available to translate this product into those languages. While it doesn’t make business sense for Microsoft to translate Office into Icelandic, it’s been done by end users because the tools are available to do so. One of the great examples of FOSS here was that of open source Canon firmware; Canon hardware allowed for two exposures to be taken at once – perfect for rapid action shots (instead of just bracketing the exposures). The Canon firmware did not take advantage of the hardware capabilities and so open source firmware was developed which provided this functionality. Andrew covered the tools available for audio by branching them out into recording and editing, creating and performing, typesetting scores and sampling. One of the great tools here is the ability to leverage free and open sound libraries, which can be remixed for new compositions. Andrew explained how hand animation has fallen by the wayside, yielding to several advanced tools in the space. One of the problems remaining to be solved here is the concept of distributed rendering. by farming out frames to different nodes to divide up the processing power needed for video animation. Luckily there is an open format available that can be used. Andrew walked us through a number of libraries for content creation, including Creative Commons and CC-licensed content on flickr. There are also a number of other open media libraries available for adoption and re-use, including freesound.org, artistx.org and Open Symphonium. This lead to a great discussion on the crowdsourcing of media production and movie production – a model which does not sit comfortably with some studios. He opened with the example of climate change, questioning whether if the data and models used in so-called ‘Climate Gate’ were made open to scrutiny and reproduceability whether the scandal would have erupted. This parallels the free software concept of favouring the ‘bazaar’ – many contributions by many people versus the cathedral – power held by a small number of members. One of the very interesting discussions as part of this talk was whether it should be a requirement of research funding that the research output be released under a FOSS license, particularly given that much research is publicly funded. The example of the East West link proposal was also discussed, particularly in light of the model used for estimates – which is closed and proprietary, and therefore not open to the same level of public scrutiny. This example was illustrated with some excellent visualisations, based on the GTFS format (for travel and transport timetables) and open street map – showing how combining open data sources can provide new insights to drive informed decision making. This sort of data also provides better opportunities for the development of ecosystems, such as consulting, review, and widens participation in policy debate. Adam’s presentation focused on a number of online vulnerabilities and the software tools that can be used to prevent them. Firstly, Adam facilitated a discussion on privacy, making the point that people don’t realise the value of privacy until it’s too late. In short, even though data about you may not be damaging, it’s nobody else’s business to know about it. This point was underlined by the http://pleaserobme.com/ example – which uses FourSquare data to predict whenyou’re not at home. Adam also gave an overview of GPG encryption for email, and keysigning for public key infrastructure. He guarded against the growing trend of software as a service (SaaS), arguing that the software is owned and managed by someone else – that someone else also owns the data. Similar arguments were made against centralised networks such as Facebook and Google +. Adam gave a great overview of privacy and security protection tools available in browsers (with his favourite being Firefox), including the proper use of passwords, not installing third party toolbars, and request policy setting to see where websites are sending your data. In particular he recommended the use of HTTPS everywhere, GreaseMonkey, User Agent switcher and No Script. In the instant messaging and videoconferencing sphere, he argued that giants such as Microsoft/Skype were reading your messages, and than open source alternatives were better for confidentiality and privacy. He also argued for the use of TOR and Bitcoin. Based on my experiences helping on the Software Freedom Day Melbourne team for several years, and the successful BarCampGeelong, I responded to linux.conf.au’s Call for Papers (CfP) with an outline of a talk around running outstanding events in the free and open source software community. The aim was to provide the skills, resources and techniques that budding organisers would require in order to manage a successful event. Fortunately, the CfP was accepted and as well as being part of the Core Team for linux.conf.au 2012, I had an extra action item – preparing an awesome presentation! After delivering the presentation (link to video below), I received lots of constructive feedback. In particular, Karen Sandler, one of our keynotes for linux.conf.au, let me know that she doesn’t use the camera on her smartphone – because it uses proprietary software. Of course, this meant that all the QR codes I’d included in the slides were effectively useless! So, the slide deck below has been updated with printed URLs. One of the more positive pieces of feedback received was around the fact I produced and printed a transcript for the presentation so hearing impaired people at the presentation could have a more equivalent experience. This year’s Melbourne-based Software Freedom Day event took a low-key approach, in stark contrast to last year’s award-winning affair. Hosted by Linux Users Victoria at The Hub in Docklands, the day kicked off with a BBQ (with opensauce – props to Lev Lafayette for a very witty pun). Unfortunately due to a power failure at Southern Cross Station, my V/line train from Geelong was delayed by over an hour – meaning I missed the BBQ. Ben Sturmfels opened proceedings by explaining the need for software freedom, and why it is so important for us to value freedom – not only in software and computing but in everything we do. A key topic of the discussion which ensued was resolving the tension between hardline ‘fanatics’ in the community – those who baulk from using any form of distribution for example which contains elements of proprietary code – as Ubuntu and Debian do – and those who take a more liberal and pragmatic approach to using free and open source software. The afternoon saw two groups of three workshops held – and I chose to attend that run by Alex Garber (@clockworkpc) on promoting FOSS and how it can be better marketed. It was clear that people were drawn to free and open source software via a variety of channels. Some arrive from a philosophical or idealistic desire to have more freedom over how they use their computer. Others have pragmatic reasons – such as lack of financial resources – for using FOSS solutions. Additionally, as pointed out by two-term LUV President, Lev Lafayette, FOSS alternatives can offer productivity and processing advantages over their proprietary cousins. This represents a distinct advantage in high performance applications such as those used in science and engineering. Participants in the discussion recounted some of their introductory experiences to Linux and open source software, with many indicating that they took a ‘softly-softly’ approach – often dual booting into Windows and Linux before making the move to a Linux only platform. The ability to use key software packages under Linux operating systems remains a key barrier to adoption; although applications such as EndNote have FOSS alternatives – LaTeX – the data formats they use are often closed or proprietary, thus making data interchange difficult. I then facilitated a session on building and sustaining FOSS communities. Many of the themes were not new, but what was so encouraging and enlightening about discussions were the depth of passion people felt for the groups of which they were a part (including Andy Gelme – President of Melbourne Community Connected Hackerspaces and Ben Sturmfels, Convenor of the Melbourne Free Software Group). We covered a lot of ground. Discussions started around community standards – standards of dress, behaviour, deportment andw hygiene are seen as important – both to set expectations and avoid ‘putting off’ potential new members of the community. The need for leadership, management and facilitation skills for those in senior roles in free software groups was discussed, without reaching consensus on whether it would be worthwhile to actually invest money in providing training for key members. This naturally led into a thread on the need for mentoring within the community – and establishing both formal and informal channels for knowledge sharing to continuously nurture a pool of talent ready to take on leadership roles. Diversity, as ever, was a hot topic – and it was encouraging to have three women (including myself) in the group of a dozen or so. The general feeling in the room was that there is no silver bullet to solving issues of diversity and inclusion – other than that as a community we have to critically examine our practises to ensure we are not being unwittingly exclusive in our behaviours. The difficulties of establishing FOSS communities in regional areas – without a large critical mass of interested people – were also touched on. Here, the group suggested having regular groups with a broader focus to ensure sustainability and sufficient interest – such as a programming group rather than one focussing on a specific language or technology. We also did some ‘blue sky’ work, and envisioned what we would like free and open source software groups to evolve into over the next few years. To summarise, the desire was to be recognised as a legitimate and trusted source of advice both for open hardware and software solutions. In particular, the desire to be viewed by industry and business as a respectable, reputable option viz a viz proprietary options, was highlighted. The need to do more ‘reach out’ type work with other community groups focussing on social equity and justice was also a strong theme of the session. 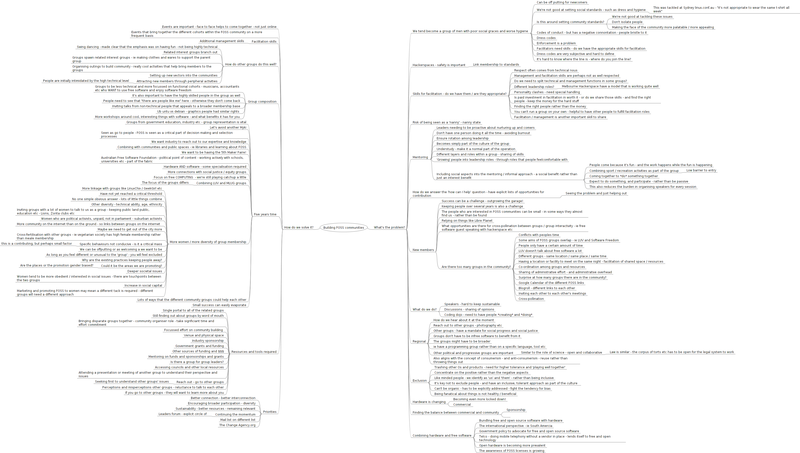 The threads from the discussion were mapped using FreeMind and are available below. NOTE: Unlike the rest of the material in this blog, this post is released under the CC-BY license as below. Software Freedom Day Melbourne 2011 FOSS Community Building by Kathy Reid is licensed under a Creative Commons Attribution 3.0 Unported License. Based on a work at blog.kathyreid.id.au.